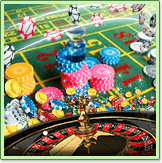 Gamblers all around the world have come to love and know the all too familiar Roulette table, and the click, click, click of the glamorous wheel. Many new visitors to casinos rush to the Roulette wheel in order to feel a part of the casino rush. It is a simple game of chance that will quickly have you squealing with delight, not to mention chasing after your number. Whether you are playing on an American wheel or a French wheel, you will see that the numbers 1 to 36 are set up in columns of 12 numbers each, and alternate between red and black. The zero or double zero are across the top and are in green. The alternation between the colors red and black for each number are coordinated with the Roulette wheel layout. For a beginning player, utilizing column bets may be one of the quickest ways in which to increase a bankroll. Some strategists suggest that if you win on your bet, then you double that bet the next time. Another option would be to split your winnings on two columns and then increase and split as you go. It is always important to remember that Roulette is a game of chance, and the idea is always to maintain as much of your bankroll as you possibly can. Keep in mind the odds of winning. Some suggest placing a bet on all black or all red, for example, as this will increase your overall odds depending upon which column(s) you choose. As you can see, the center column has more black than the inside or outside columns. So betting all black to increase your center bet odds is a good way to go - however, the payout is only 1:1. Say you have a feeling the next number rolled is 23, so you place a bet on 23. Maybe your favorite number is your birthday and you choose that number. If it hits, you win. Take your favorite number or your intuition number, and place a single bet that covers that number and the adjacent number. Then hope one of them hits. You are getting the hang of it, but remember that this is best when you start building up your bankroll. Increasing your odds decreases the payout, which only stands to reason. Six of one, a half a dozen of another. No matter how you slice it, six are better than one, at least when it comes to increasing your odds of winning. Typically a column bet, or can be the Dozens bet. All one color bet black/red, odds/even, or high/low number bets. All outside bets listed here are 18 number bets and pay 1 to 1 except for Columns and Dozens, which are 12 number bets paying 2 to 1.
is any adjacent numbers. So for example: you place your chip on 23 and any one of its adjacent numbers. Look at the table to see the many possibilities. is another inside bet. This is basically a row. Maybe you will go 1 -3, or 4-7, etc. The payout for walking on the street is 11:1.
covers four numbers, for example 1, 2, 4 and 5. Simply place your chips on any juncture of four numbers. This shares a payout of 8:1.
is similar to the street, but you cover two streets at a time, giving you the six number approach. Its payout is 5:1. Even money bets are those bets that pay even money, meaning 1:1. So, you bet $5 on all the black and a black number shows (see table 1 for what numbers that may be). You get paid $5 for the win, and keep your original bet. Thus, your $5 bet earns you $5. Again, any time you bet an amount and the payout is the same as your bet, it is an even money wager.